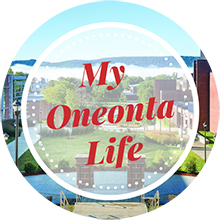 Students choose SUNY Oneonta for lots of reasons. Our welcoming campus. The “just-right” size of our college community. The idyllic setting neighboring the City of Oneonta. But what sets us apart most is that we focus, day in and day out, on exceptional living and learning opportunities. Our curriculum is flexible, diverse and challenging, with resources to match all kinds of interests. And we’re committed outside the classroom to offering a wide range of options for socializing, entertainment and engagement. It's easy to be happy here.